Jim Christiansen of Ch ristiansen Custom Woodworking is an absolute pro. The Southside Woodshop has collaborated on a few projects with him and it is always a pleasure to work with him. He finds himself working on interesting projects in Des Plaines, Illinois. A recent kitchen job he took on was described to us as a perfect collaboration designers and craftsman to give the homeowner exactly what she wanted. Jim’s client owns a late 1800s era Victorian home and the most important part of this project was to do a complete kitchen remodel while preserving the integrity of the original architectural design. There is something undeniably romantic about an old house, and preserving that intangible yet unmistakable charm is often a failed venture when doing a total remodel. Finding a good contractor and designer is arguably the most important part of this process. Jim has plenty of experience with these types of projects and quickly understood what the homeowner was trying to achieve. 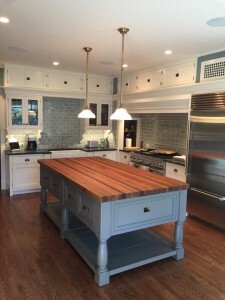 When it came time to settle on a top for the island he reached out to us for some ideas and we settled on the champagne of hardwood countertops. Teak is the last and the highest court of appeal for wood furniture. 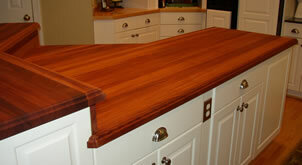 There is nothing more beautiful, nothing more expensive, and nothing more worth it than a custom Teak wood countertop. 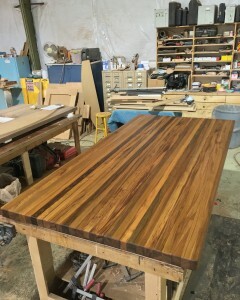 This particular countertop was 2.25” thick edge grain construction. We put a ¼” roundover on the top and bottom edges. The homeowner stressed a desire to be able to prepare food on their top so we finished it with our food safe mineral oil. A monthly refresher coat of the oil is recommended. 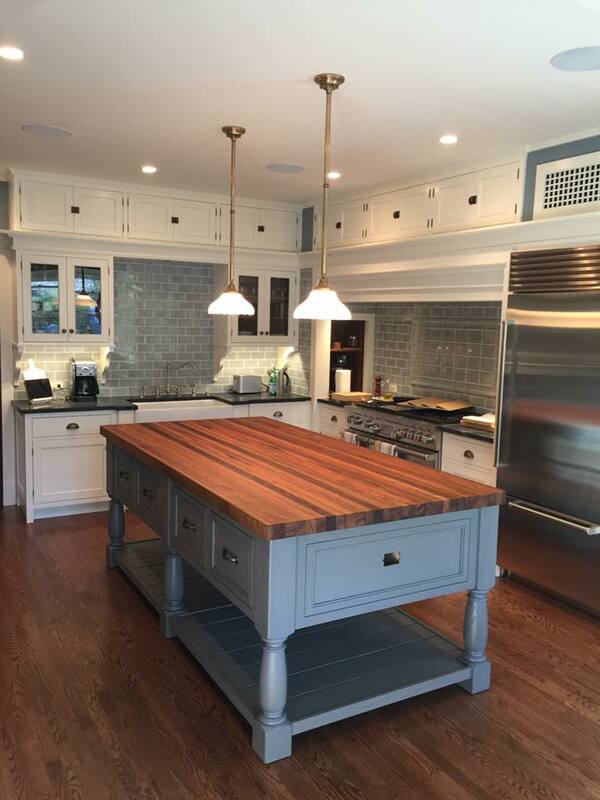 Jim built a beautiful kitchen island to house our Teak top out of gray stained white oak. The rest of the kitchen was white painted cabinetry. When everything was completed what we were left with was “the most incredible kitchen project I have had the pleasure of being involved in” as Jim put it. We can’t wait for our next opportunity to work with the fine folks at Christiansen Custom Woodworking. Keep making us look good, Jim. 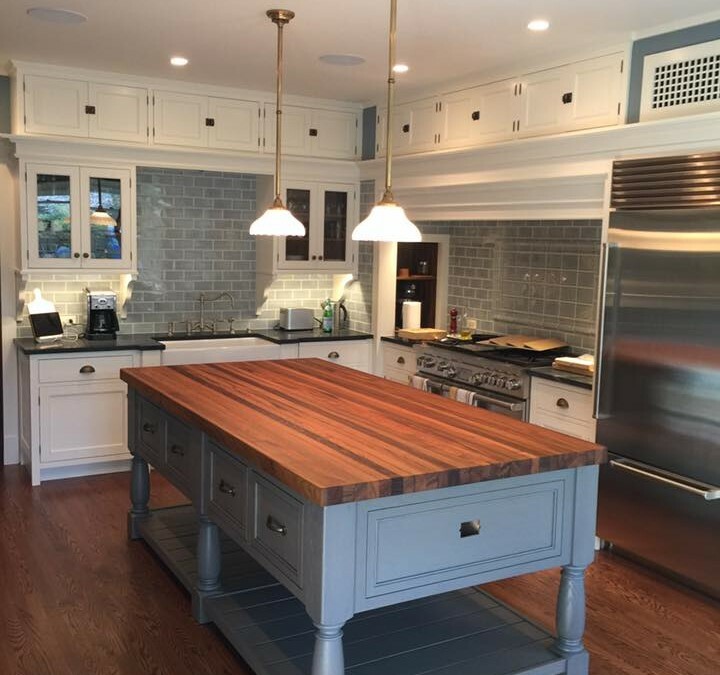 Ready for your own custom wood countertop? Let’s talk about it. Go to our Request a Quote page and get started today. We’ll reply with your quote within 24 hours.